The season of Seville orange is relatively short. If you happen to have a palate for the bitter-sweet-tart tang, run don’t walk, and buy some, before the fruit disappears again. 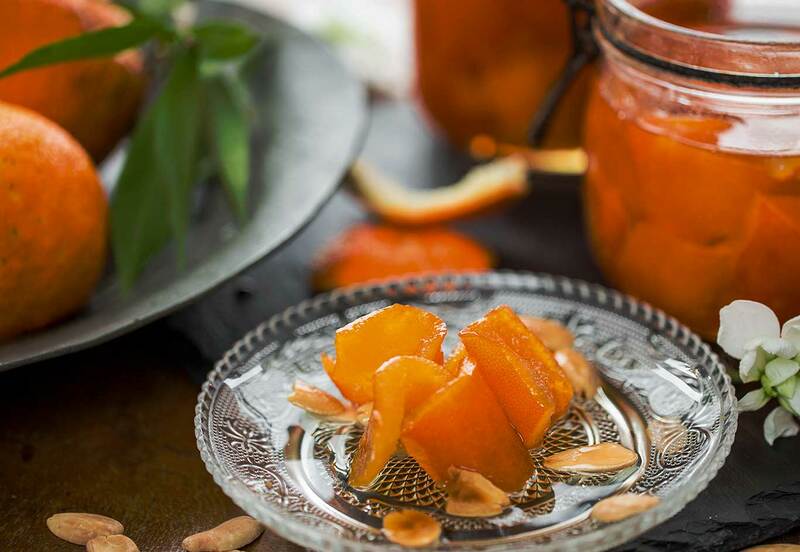 Murabba Al-busfeir is a classic store-cupboard preserve, which is prepared uniquely with the peel; but do not discard the pulp to extract the juice and use in savoury dishes. The juice freezes well and can be conveniently stored in ice trays, giving you the freedom to use as many or as little as you need. Murabba Al-busfeir is not a mere jam. It is both a treat and a pudding. It can be served with a cup coffee as snack, or after a meal as pudding, as it can serve to embellish and garnish other desserts. I even knew someone who ate one curl for breakfast, claiming that it helped her start the day with zing. 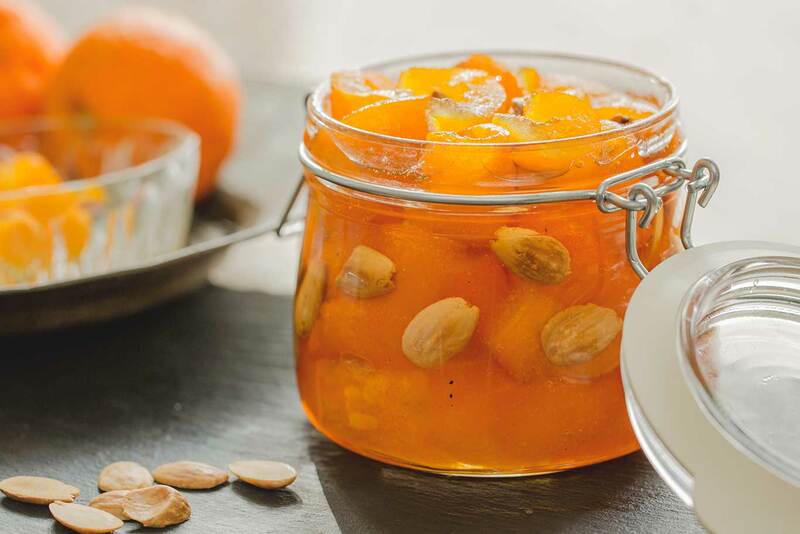 To add texture and offset the sweetness of the syrup, I like to combine them with a handful of toasted almonds. Wash and dry the oranges. Lightly scrape off the unsightly black bits with the sharp side of a knife. Cut off the top and tail, and score the orange from top to bottom about 6 to 8 times, depending on the size of the orange. Peel off the rinds; ideally you want to have wedges that are about 2 cm / 1 inch wide. Do not discard the pulp which you can press to extract the juice. 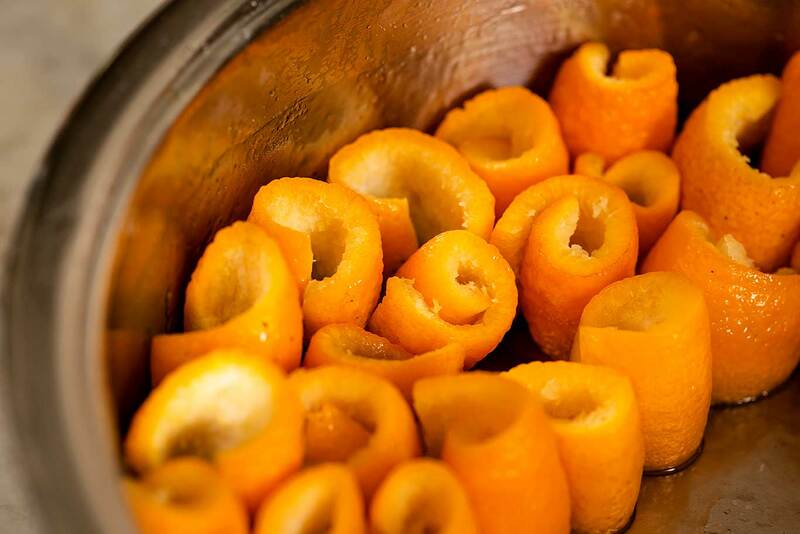 Place the orange peel in a deep pot and cover with water. Bring to a boil, reduce the heat, and simmer for 10 to 15 minutes. Drain the water, return the peel to the pan. Add fresh water, and leave to soak for 24 hours, changing the water about 5 times to get rid of the bitter taste. Toast a handful of split almonds in a hot oven at 180ºC / 350ºF for 7 minutes and set aside. The next day, drain the orange rinds and discard the water. You can either do as I do: roll them and arrange them upright in the bottom of the pan, one next to the other as tightly as possible. Bearing in mind that the curls will not remain as tightly coiled when cooked through. Alternatively, thread about 10 rolls at a time, with a needle and twine. This will keep them perfectly twisted. Once you’ve rolled all the rinds, make a syrup. In a separate pot add the sugar and water, place over medium heat and stir to dissolve. Increase the heat, and when it starts to boil, skim any resulting scum and leave to simmer for approximately 10 minutes. 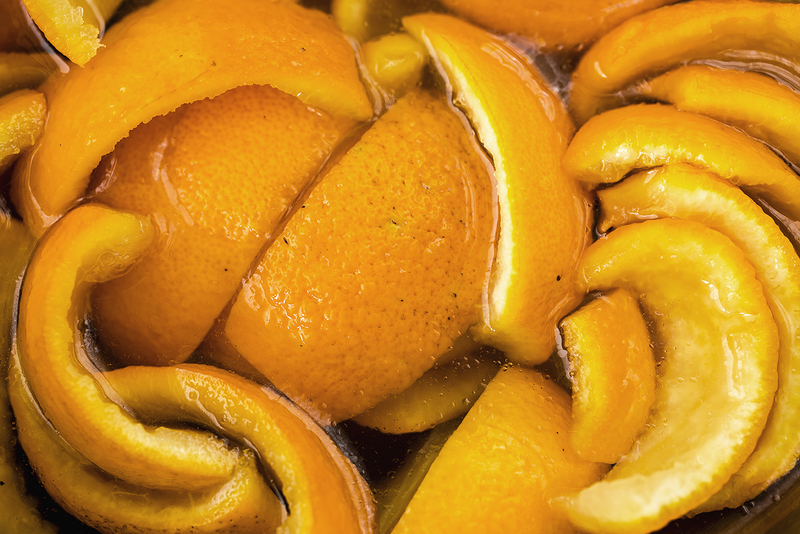 If you ‘ve opted to thread the peels on a string, incorporate them directly into the syrup. If, however you’ve arranged the rinds in the bottom of the other pan, then pour the syrup over them. Cook on a rapid simmer for 25 minutes, until the peel is tender. Add lemon juice, and cook for a further 5 minutes. Lift from the pan with slotted spoon. Remove the threads if you have them, and arrange the coils in sterilized jars. Add a few toasted almonds in between if required. Should the syrup feel too runny, return it to the pot and reduce it over high heat for a couple more minutes before ladling it over the orange curls. To check the consistency of the syrup, trickle a couple of drops on a cool worktop to test its consistency. Thanks for your comment. When washing and soaking in water, you do lose some of the bitterness and none of zesty aroma. The sugar makes it sweeter and enhances also the flavours.